The Nigerian people take pride in being the largest black nation in the world and also the largest country in Africa with a population of over 180 million people. The country is made up of three major ethnic groups and these three represent about 70% of the total population of the country. The other 30% is shared by over 370 ethnic diversities which speak over 700 different languages. The three major ethnic groups in Nigeria include the Hausa-Fulani, who predominantly occupy the Northern region of the country, the Igbos, who occupy the South-East and the Yorubas, who occupy the South-Western region. Nigeria is a West African country located in the southern coastal part of western Africa. The capital of Nigeria is Abuja and Lagos is the country’s largest city. As mentioned earlier, there are 3 major ethnic groups in Nigeria: the Hausa-Fulani, the Igbo and the Yoruba and all together, these three groups constitute about 70 percent of the nation’s population. The distribution of Nigerian people among the remaining ethnic groups is in such a way that 10 percent is constituted by some other groups numbering more than 1 million each. These include the Ibibio, Kanuri, Tiv etc. More than 300 other ethnic groups constitute the outstanding 20 percent of the population. There are about 162.5 million Nigerians (According to the World Bank and United States Census Bureau). This makes Nigeria the 8th most populous country in the world and the largest in Africa. Nigerian people have a high fertility rate which accounts for the population explosion witnessed in the country in the past 50 years. The population of Nigeria has increased from 37 million in 1950 to 158 million in 2010 and about 180 million in 2015. This represents about 400% increase in the past 60 years and if things continue with this trend, Nigeria’s population will be more than 0.6 billion in the next 60 years. There are quite a lot of cultural diversities among the people of Nigeria as are many ethnic groups in the country. Despite the influence of the Western world, the people of Nigeria still treasure their traditional languages, art, music, dance, literature, food, etc. The official language of Nigeria is English. It is used as a means of communication in all government interactions and in all government and private-owned schools. However, each ethnic group has its own language. Pidgin English is also a “national” but informal language spoken across the country. It is basically a blend of the English language with Yoruba or Igbo grammar structures. Pidgin came into existence as a result of the need for British sailors to discover a way of communicating with local traders but in the modern day Nigeria, it has become a common form of communication in ethnically mixed urban areas among people who have no formal education in English. Before the coming of the British and the subsequent Western colonization of Nigeria, houses in rural areas were usually built to fit the environment where the people live. For example, the Ijaw people of the Niger Delta region had more water than land and as a result, they built their houses on stilts over creeks and swamps, and movement between these houses was by boat. Houses in those days were also constructed with available resources in the area. Consequently, due to easy access to bamboo, vines, banana leaves and mud, Igbo houses were commonly built with these materials. They were made with bamboo frame held together with vines and mud and roofed with banana leaves. In the north, however, homes were typically geometric, mud-walled structures, usually with Muslim inscriptions and decorations. These group of people built large, walled compounds accommodating many other smaller huts. The compound could only be entered through the hut of the head male figure- a large hut built into the wall of the compound. With the influx of foreigners, Nigerian cities have grown to become like many Western urban centers. Houses are now built with cement and rods no longer natural materials like mud and grass. The South Western part of Nigeria is home to most Yorubas and they are among the group of Nigerian people where culture is still pretty much preserved. They are well involved in arts and have a long history of poetry, beadwork, metalwork, weaving and mask making. The typical artwork of Yoruba is made to honour the ancestors and gods as they believe in a lot of deities. Yorubas, just like the Greeks, have over 400 deities, so there are a lot of artworks and sculptures to be made. The Igbos occupy the South Eastern part of Nigeria divided into the eastern and western region by the river Niger. 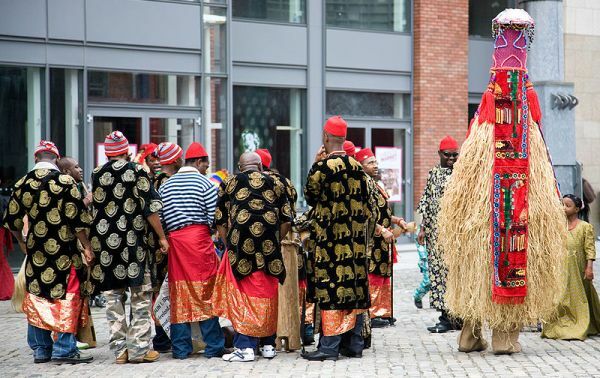 Historically, the Igbos originate from Nri community dated back to the stone age. Igbos are known to be highly enterprising and industrious, a trait that has been in the group for a long time. They have a colourful and warm cultural display and all around them are other ethnic groups like Ogoni, Ibibio, igala, Bini, Warri, Tiv, Ijaw, Yako etc. Among the Nigerian people, the Hausa/Fulani occupy the northern parts of the country and their population spreads beyond Nigeria, involving other parts of West Africa where they constitute the largest single ethnic group in West Africa with a population of over 30 million. In Nigeria, Hausas are often taken as same with the Fulanis. The cultural similarities between the Hausa and Fulani allow for significant marriage and integration between the two groups. This has resulted in the term “Hausa-Fulani” being used as one entity to depict Hausa or Fulani. The most popular cities occupied by Hausa-Fulani in the Northern parts of the country include Kaduna, Sokoto, Katsina, Zaria, Jos, Kano, etc. Christianity and Islam are the two main religions in the country and statistically, Islam constitutes about 50% while Christians make up 40% with the remaining 10% being practitioners of traditional religion and atheists. Muslims dominate Northern Nigeria while Christians dominate the Southern parts of the country and periods of peace are marred by occasional violence between the Christians and the Muslims. Football is the national sport of Nigeria and the national team is called the Super Eagles. It is a sport that the country is comparatively good at and has won the African Cup of Nations on several occasions. There are several foods prepared and cooked in Nigeria and most of these are tailored towards the various cultures of the different ethnic groups. Their method of preparation differs among the various tribes even when the same foodstuffs are used. Most common Nigeria staple food include rice, beans, yam, millet, cassava, plantain etc. Nigerian fashion is highly trendy and revolutionary. You often find the latest designs and redesigns of styles and patterns. The typical wear is colorful especially for the women and the traditional wear of most Nigerian men and women is the style called buba which is usually sown as a loose fitting long-sleeved shirt or blouse. Other common styles include skirts, trousers or pants, Scaff and are mostly made of Ankara material. Nigeria had her independence from England on the 1st of October, 1960 and there are a lot of younger population group making 19 years the average (median) age for Nigerian males and females. There are slightly more men than women in Nigeria in the ratio of 1.04 males for every female. Owing to the insecurity of lives, threats from crimes, natural disasters and pollution, the average life expectancy in Nigeria is low with men having 46.16 years and women living 47.76 years nevertheless, the population of Nigerian people is still on the increase due to high birth rates. There are 36.65 newborns for every 1,000 people, making the country the 28th highest in the world in terms of birth rate.